Tony Duquette, Citrine and amethyst bracelet. Estimate $8,000–12,000. Cartier, Paris, Three coral and enamel 'Coccinelle' clips. Estimate $20,000–30,000. Van Cleef & Arpels, Pair of diamond ear clips. Estimate $25,000–35,000. Emerald and diamond brooch. Estimate $30,000–50,000. Two gold and diamond brooches. Estimate $6,000–8,000. Van Cleef & Arpels, France, Gold 'Vintage Alhambra' necklace. Estimate $6,000–8,000. Tiffany & Co., Diamond bracelet. Estimate $18,000–22,000. Bulgari, Gold and diamond 'Parentesi' watch-bracelet and cuff-bracelet. Estimate $10,000–15,000. Tiffany & Co., Gold, Coral, emerald and diamond brooch. Estimate $10,000–15,000. Van Cleef & Arpels, Gold, coral and diamond bracelet. Estimate $10,000–15,000. Van Cleef & Arpels, France, Gold, coral and diamond bracelet. Estimate $15,000–20,000. Van Cleef & Arpels, France, Gold and diamond bracelet. Estimate $25,000–35,000. Verdura, Suite of gold, diamond and gem-set jewelry. Estimate $12,000–15,000. David Webb, Gem-set and diamond ear clips with interchangeable centers. Estimate $20,000–30,000. Kutchinsky, Gold, Tiger's-eye quartz and diamond pendant necklace. Estimate $10,000–15,000. David Webb, Pair of coral, emerald and diamond ear clips. Estimate $5,000–7,000. David Webb, Coral, emerald, sapphire and diamond clip-brooch. Estimate $12,000–18,000. Van Cleef & Arpels, France, Gold and diamond 'Cheveux-D'Ange' necklace. Estimate $20,000–30,000. 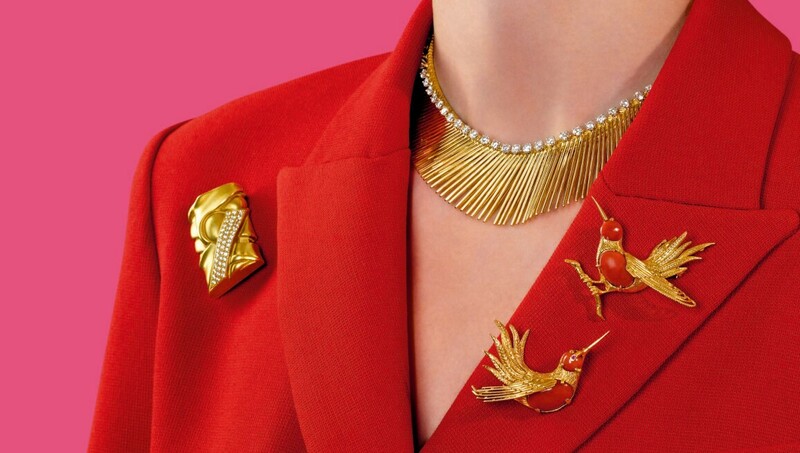 One by Cartier, Two gold and coral brooches. Estimate $8,000–12,000.